When my partner Kato told me she was asked to design a breakfast cookbook I didn’t really get it. How exciting is breakfast? – the one meal that’s usually sans wine. Who would buy a book on bacon & eggs! Well, I was very wrong. ideas for breakfast along with photography and food styling that tops the LCBO’s Food & Drink. Honest. 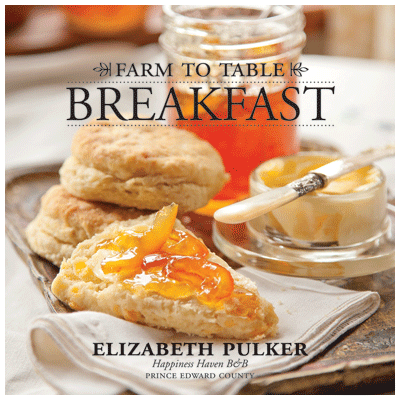 Farm to Table Breakfast is the creation of County B&B owner Elizabeth Pulker whose passion for beautiful breakfasts comes through on every page. As does her love of, and connection to, food producers in the County. It will change your whole take on breakfasts (that makes two of us) and probably send you scurrying down this way. After breakfast, of course. Please excuse my shameless promotion of the County, and Kato’s excellent design work. I’m a sucker for all that’s good in life. I think it deserves your support.